For those of us who have collected comics for a long time, the following guidelines may seem obvious. 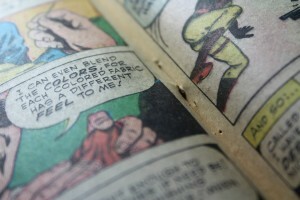 For collectors new to the hobby, however, these points may just save a precious comic book from being damaged. 1. Avoid rolling the comic, as you would a newspaper. 2. When handling a comic, do so gently. Avoid holding it tightly. 3. Always handle the comic flat in the palm of your hand, and turn the pages carefully, allowing each page fall down gently on its own. 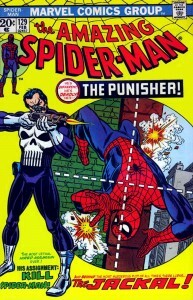 In doing so, you avoid placing any pressure on the comic book or its spine. 4. 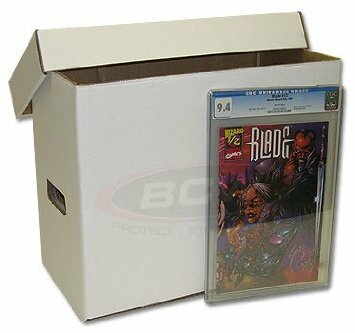 Comic stores tend to organize their comics standing up in comic boxes or bins. When perusing these comics, avoid bending the top of the comics down over the previous books. If you bend the spines while searching for a particular comic book, you will damage the spines for the next customer who comes along. 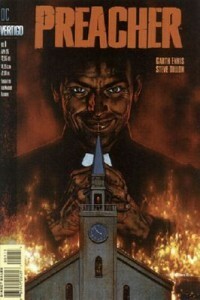 That being said, a previous customer could very well damage the spines of comics you want to purchase. 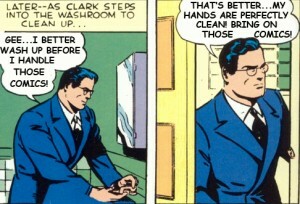 Always handle comics with care and respect. 5. When enjoying trade paperbacks or graphic novels, simply cradle the spine of the comic book and open it just enough to read. Avoid opening the book completely and “cracking” the spine, and never grasp the comic by its covers and read in the air, doing so will surely cause dents on the covers and the pages. 6. If paperbacks or graphic novels have been stored in extremely cold weather, let the books acclimatize to room temperature before opening it to read. Opening a “frozen book” could cause the spine to crack. If the glue on the spine becomes very brittle due to t e cold, the cover may even pop off. 7. Avoid “dog ears”, that is, don’t bend the corners of the pages to place mark where you last read. Invest in a book mark. 8. Eating while reading is a bad habit, especially around valuable comic books. If crumbs fall into your book, this could stain your comics or cause impressions when/if your comics are stored. If you handle food while reading, you may also actually transfer oils from the food you eating directly to your comic books. 9. Always keep your hands clean. We naturally excrete oils and these are easily transferred to your comic books, especially if they are being held tightly. The trusted comic book long box (made from card board). Will keep harmful UV rays away from your comic books. 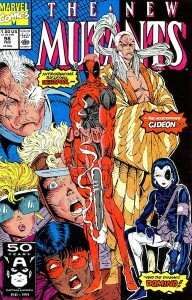 there are a variety of comic boxes to choose from. 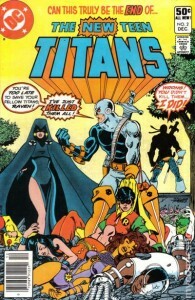 Mylars and Mylites are the preferred choice of comic sleeve. These are museum grade and while they may cost a little more, the will last a lifetime. WARNING: Be careful when using the stiff Mylar bags, comics can be damaged when inserting them, take your time. 11. 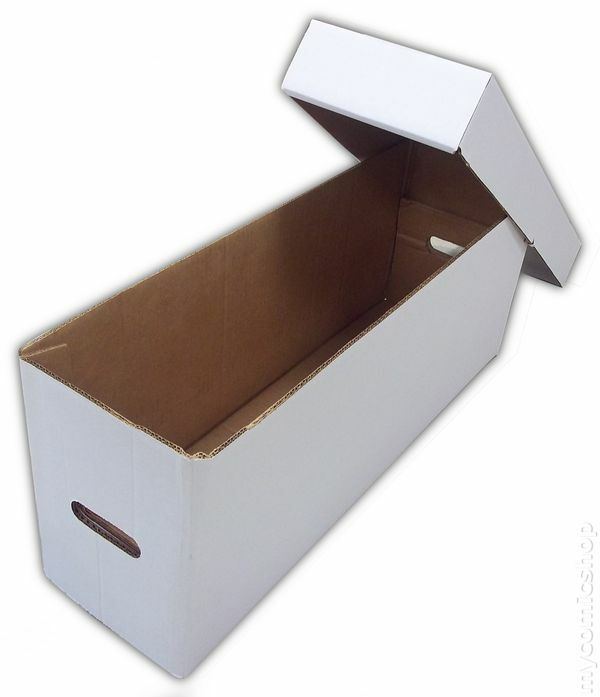 Avoid storing your cardboard comic boxes directly on the basement floor, especially if it is concrete. Use a palette of some kind or shelves to keep the boxes off the floor. Over time, boxes may absorb moisture from the concrete and even the carpet. Moisture + comics is a no no. 12. Again, this was mentioned in an earlier post, but avoid exposing your comic books to direct sunlight, and even bright artificial light. 13. 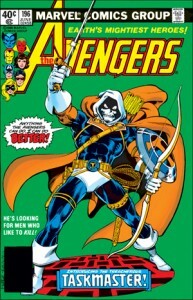 Don’t write on your comic books or colour in black and white areas! It is not a colouring book. Also, be careful not to write on paper with a comic book beneath your work – this will cause impressions on the comic book cover and although this sort of damage can be minimized with a good press, often times the impression is still faintly visible. Darn the Mego Corp! They tempted kids all around the world to cut out their order forms and purchase their action figures! 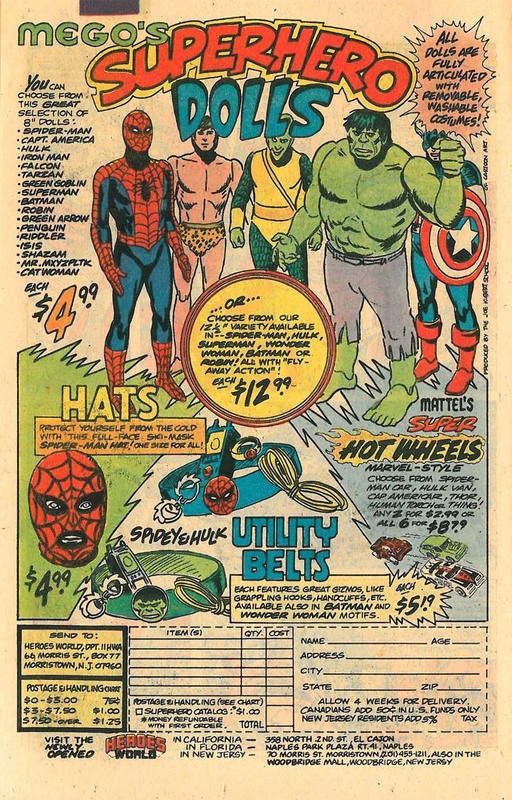 I wonder how many comics were ruined because of Mego! Old CGC Labels – Are they More Valuable? CGC old style red label – now discontinued. Comics Guaranty LLC, also known as CGC, is the first independent and impartial third party grading service for comic books and has become the industry standard (in North America at least) since opening it doors in early 2000. 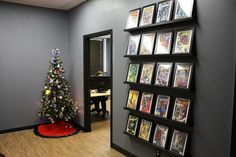 From its headquarters in Sarasota, Florida, CGC has graded thousands of comic books, and the trend to grade isn’t showing any signs of slowing down. 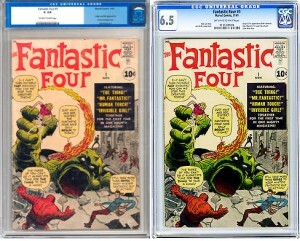 Those new to collecting graded/ slabbed comics may not realize that CGC’s first grading system was slightly different than its current set-up. A red label, for example, was once used for modern-age books. 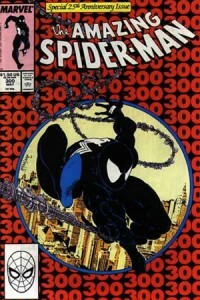 This label – which looks quite different from the current design – has been phased out, and extended the blue universal label to include modern comic books as well. 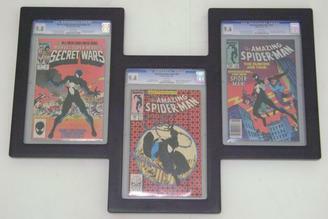 These early CGC labeled slabs, and the comic books found with them, will be the focus of this blog. Old Label CGCs – Really Worth More? It is widely believed by collectors, and even CGC insiders, that old label comic books were graded far stricter than those comic books being graded today. Also, since CGC didn’t offer pressing and cleaning services in its infancy, there is a very good chance that comics found within old label slabs most likely did not undergo the procedure. This information is very exciting, especially for anyone in possession of a valuable comic book encased in an old label slab – where a single grade jump could mean the difference of thousands of dollars. 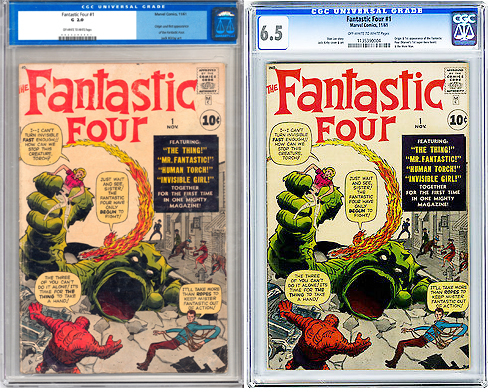 Old label CGC slab on the left compared to the company’s current, more recognizable design on the right. Lets examine a Fantastic Four #1 for example. 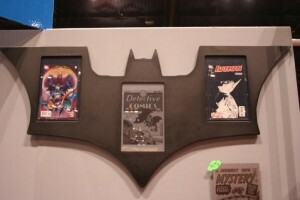 Say you were fortunate enough to own a copy that had been encapsulated in a 3.5 old blue label CGC slab, according to comicspriceguide.com, the comic is worth $6900. 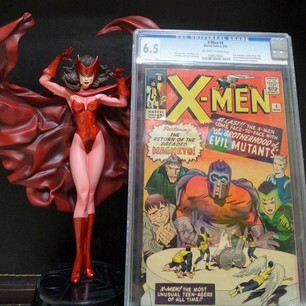 If you were brave enough to free the comic from the old CGC slab, and re-submit, it may come back a half grade to a full grade higher, in which case the value would jump to between $7200 – $8000 or a potential increase of $1100. 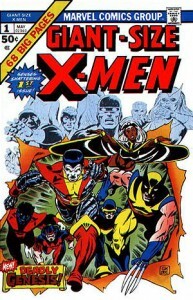 If the comic book was pressed and cleaned, the jump in value could be even higher, perhaps a 5.0 or 5.5. 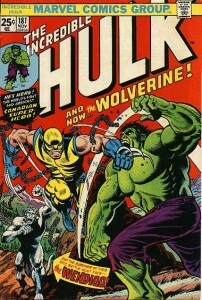 In this case, the comic book guides for $9600 – $11,200. That’s an increase of $4300. The potential payout on some of these old label CGC comic books is really quite amazing, but it is a gamble and the following are risks you should be aware of. 1. 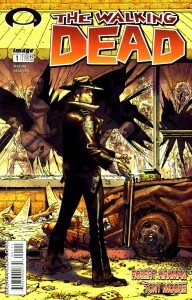 Removing the comic book from its case does void its current grade. And although the upside to submitting old label CGC comic books can be beneficial, I have encountered those who have had comic books returned with a lower grade. 2. 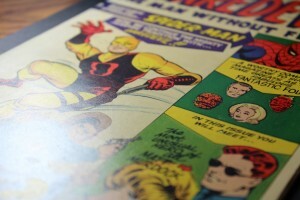 By removing the comic book from its protective slab, you run the risk of damage befalling the comic…so be careful! Even the process of freeing the comic book from a CGC slab takes finesse. 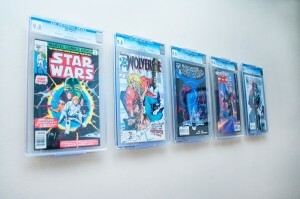 Check out this youtube video on how to “free” your comic from a CGC slab. 3. You still have to send the book back to CGC, which not only costs money, but once again the risk of damage is great, plus postage mishaps could happen. 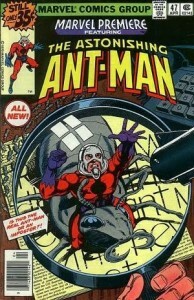 I have some rather valuable comics currently sitting in old label CGC slabs, and I do intend on re-submitting…some day. To be honest, I am in no rush and must admit I do feel weak at the knees when I contemplate cracking open these old slabs. The potential gains are great, but in the end it is up to you. Most of us have invested lots of time and money to grade and slab your favorite comic books, and now they are stored away in a comic box at the back of a closet in your home.For some, this truth is a travesty. Most slabbed comic books are stored in these. 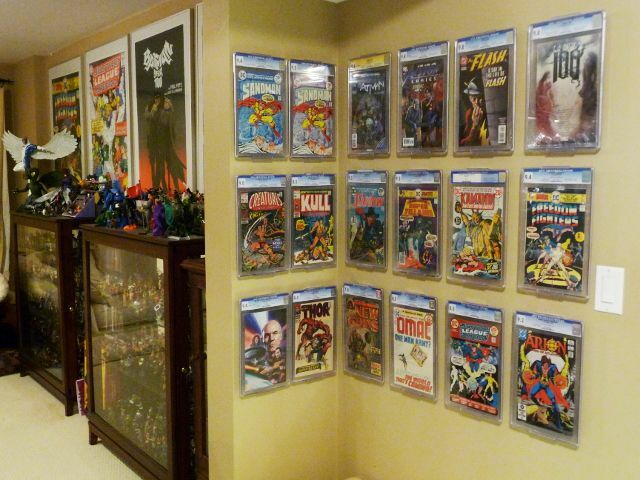 Many collectors, on the other hand, prefer to display their slabbed comic books in dynamic ways in and around their homes. This article will provide images and information about of a few of these. Before I move forward, be warned that choosing to display your books could potentially damage them. 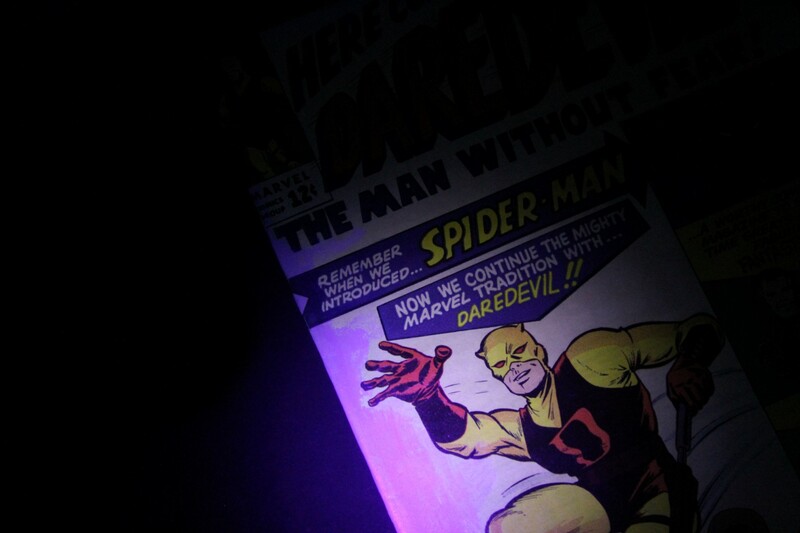 The UV light that is produced by natural light and even some artificial light sources can hurt your comic books. The plastic cases used by all of the grading companies are not UV resistant. This being said, there is a product I will examine towards the end of this article that may help with this. Wall mounts are easy to use and inexpensive. 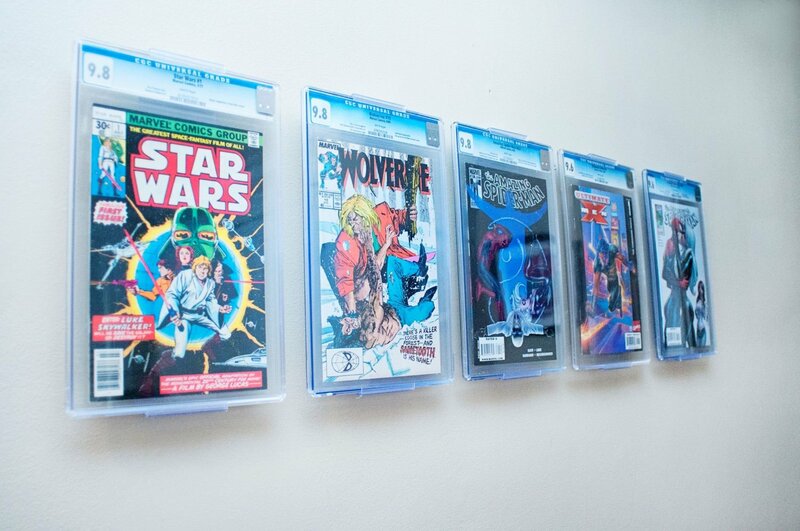 The simplest and cheapest way to display your graded comic books is the use of a plastic wall mount. These mounts are inexpensive and pretty simple to use. This is one of the easiest ways to get your books out of the box and on to the wall. 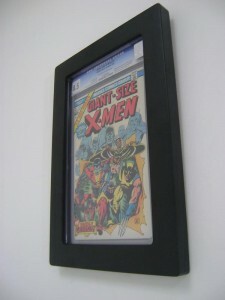 These mounts can also be used as holders that will securely keep your comic books upright on a shelf or display case. Keep in mind that slabbed cases are great looking on their own, so this technique can look quite sharp if executed correctly. 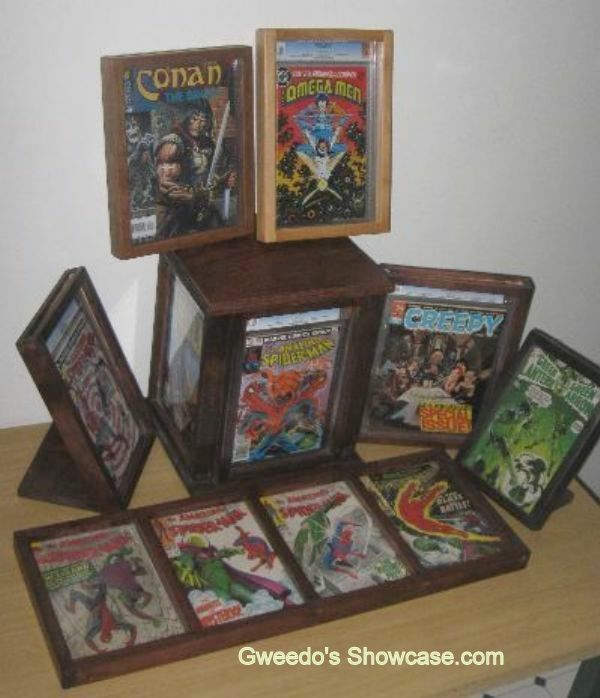 A comic store called Gweedo’s Comics in Utah sells handcrafted rustic wall frames and display cases for both raw and slabbed comic books. Gweedo’s also frames magazines, LP Records and even video game cartridges! 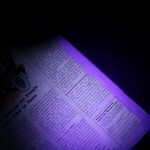 When ordering, options for stain colour and glass type (UV resistent/non-UV resistant) are offered. Check out their website for more details. a three-step sanding process and a pristine and durable Powder Coat Finish. The Collector’s Resource offers tons of different frame sizes and styles, including their new POD frame, tri-fold frames and even a Bat-Frame! Check out the Collector’s Source for yourself for more information. 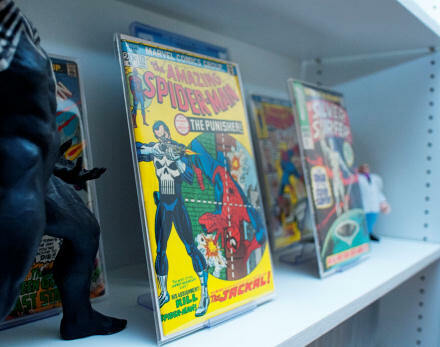 If any of the above display methods appeal to you, be sure to take a look at The Collector’s Resource UV filtering film which can be applied directly to any slabbed comic book. 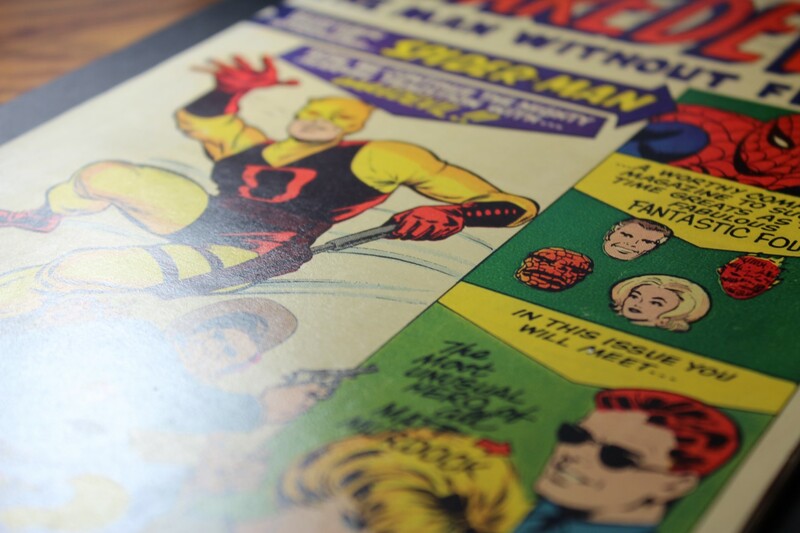 These museum grade adhesive sheets will actually block out 98% of these harmful rays, thus providing some degree of protection to your treasured comic books. Again, I just want to stress that you may be putting your prized comic’s in harm’s way should you choose not to use a UV-resistant product like this. There are many companies out there that manufacture and sell display frames and other products to help you effectively display your slabbed comic books, so be certain to visit the websites mentioned above, and do some research yourself. And please share your findings with us as well! Below I have included a few pictures of some very cool ways collectors have displayed their comic books. …and remember, before you display your comic books, be sure they look their best – contact The Comic Doctor to find out how! Effective display using IKEA frames! Display significant books with a corresponding statue – Brilliant! Send me your displays and I will post them here… thanks for reading.